Is it possible to combine functionality with style and looks? On this used Sea Ray 44 Sundancer it certainly is. When the Sea Ray 44 Sundancer was launched in 2003 it was lauded by the international media as the most stylish Sea Ray sportsyacht ever built, with a design emphasis on curved, graceful lines reflective of contemporary Italian styling. 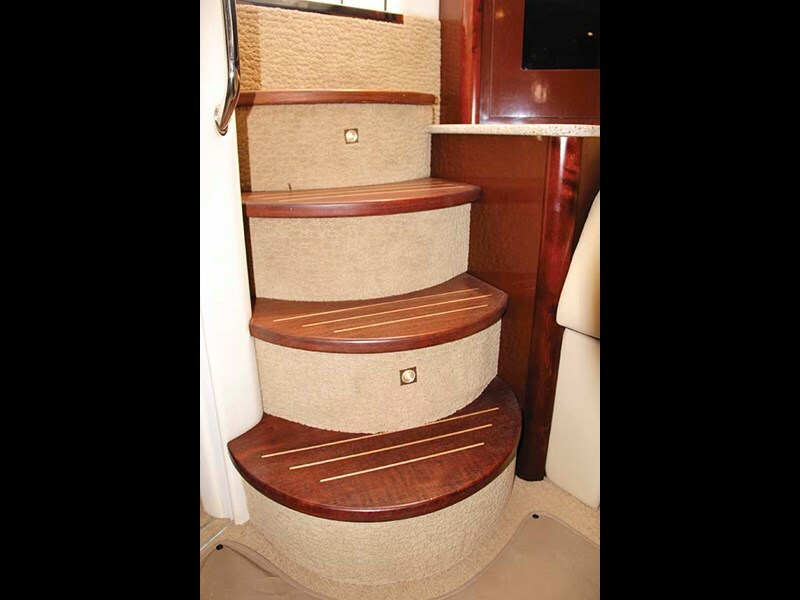 But, as is so often the case, the danger with accentuated styling is the trade-off with interior volume and the practicality of an interior layout often shoehorned into the boat’s exterior envelope. The designers of the Sea Ray 44 Sundancer proved that it was indeed possible to blend form and function and created in that model a sense of opulence and purpose seldom achieved in a mid-size sportscruiser. Belzara is quite simply a stunning example of the Sea Ray 44 Sundancer and one that is equipped to a level that provides her owners and guests with all the comforts and convenience of an up-market city apartment. But beneath the flowing curvature of her sheer line sit a pair of 500hp Cummins QSC diesel engines with digital throttles offering up the promise of a rapid escape from the madding crowd whether for an hour, a day or a week. 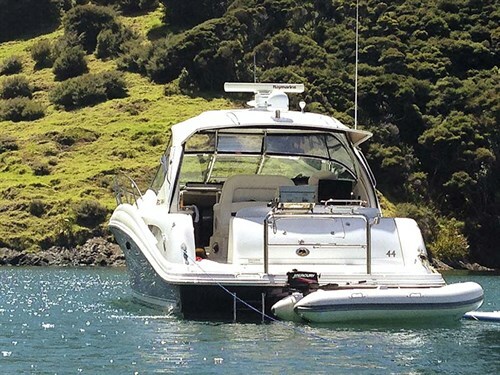 Imported new into New Zealand in 2008, Belzara is a one-owner boat with a striking blue hull, and the care and attention lavished upon her is obvious at every turn. This extends to the boat’s systems which have been maintained and upgraded to ensure complete turn-key reliability. The Sundancer’s owners have been boating for 30 years and this is the third Sea Ray Sundancer they’ve owned during the last 10 years. They started off with a 30-footer, then went to a 36-footer before purchasing the 44. They’ve loved their time aboard Belzara but say it’s time to move up to a 50-footer. 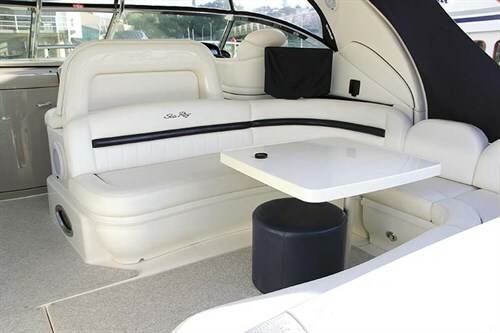 The options on Belzara are endless with features like an extended swimplatform, cockpit hardtop providing all-weather protection, and a large cockpit boot locker that swallows fenders and lines with ease. The large swimplatform has plenty of room for the Aquapro tender and outboard on the rear staple, while a paddleboard and kayak also reside along the stern ahead of the barbecue. 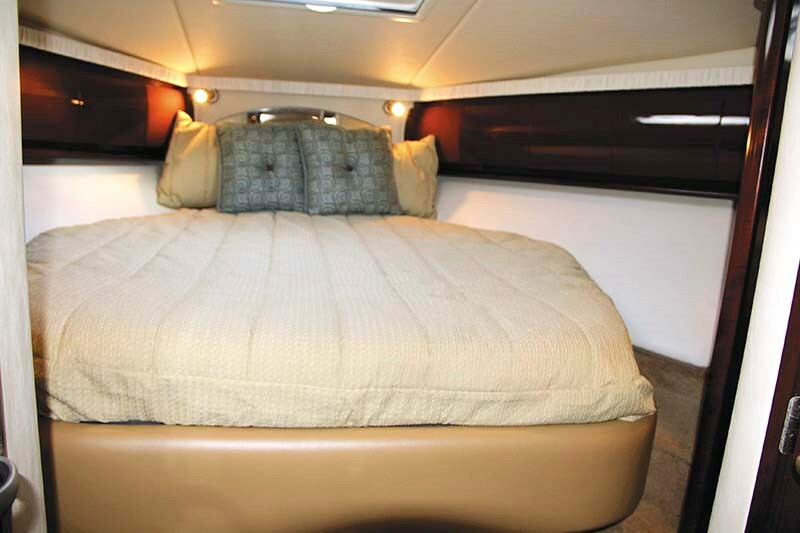 There’s a swimladder, hot/cold transom shower, a wide marlin door, clip-in cockpit carpet and a social seating layout with a giant U-shaped lounge set around a centrally-mounted table. All told, eight can do lunch. There’s even a Sky-enabled flatscreen TV in the cockpit. 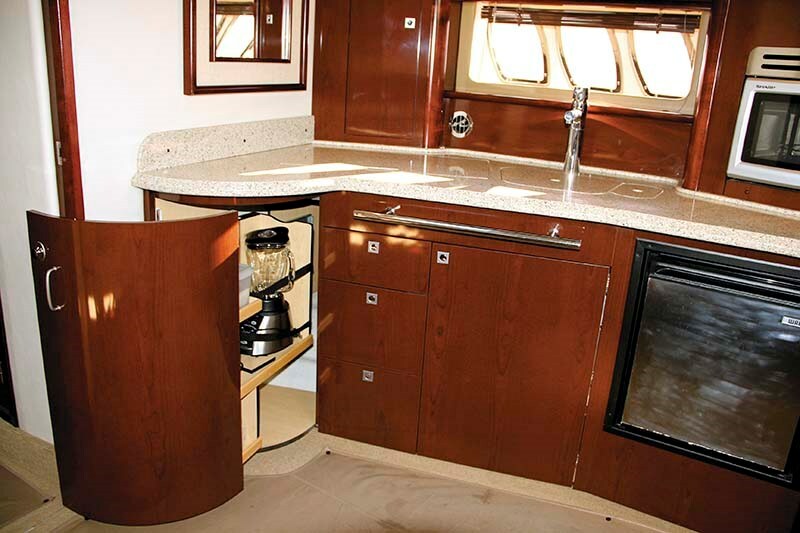 The moulded portside cockpit amenities centre opposite the dinette features a 12V fridge, grabrail and sink, small Corian counter, and a good amount of storage space. Yet for all this, there’s still a lot of floor space for clear passage to the helm and below-decks. Access to the bow is via cockpit steps and wide sidedecks with moulded toerails, assisted by a bowrail with intermediate wire, grabrails on the cabin top and a good grade of non-skid. 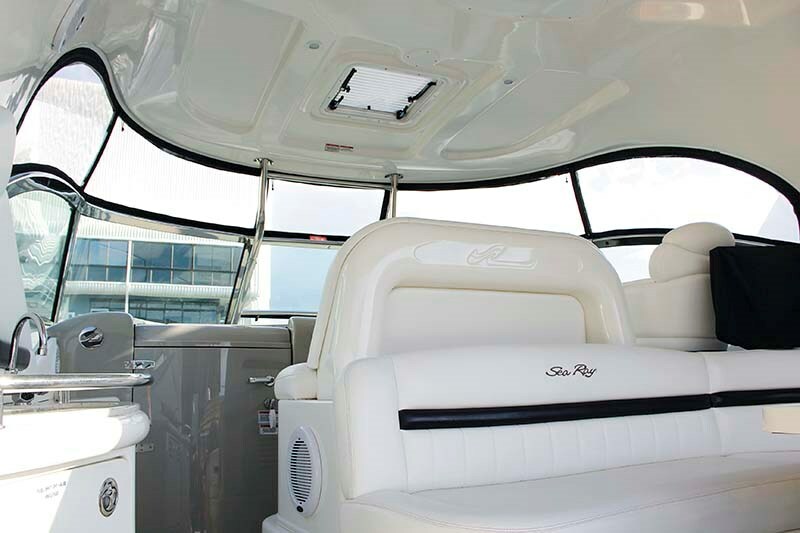 The boat also has two clip-in sunpads on its foredeck, a spotlight, windlass, plus forward freshwater washdown. As with sportsyachts of this calibre, the 44 Sundancer is a social cruising boat where everyone travels on the same level as the skipper. A high-backed helm seat is alongside a two-person co-pilot lounge, with storage ranging from a side pocket to various under-seat holds and sub-lounge recesses. Head, shoulder and leg room are generous. 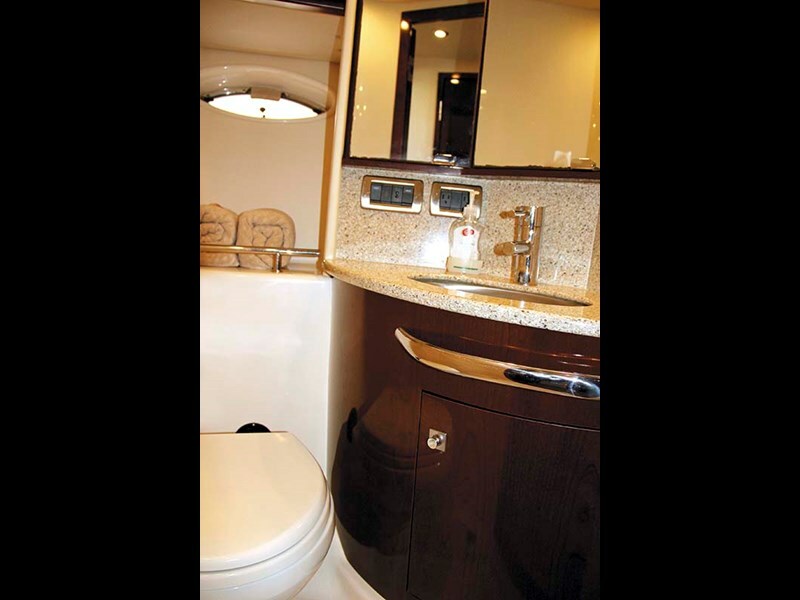 Owners are the priority aboard the 44 Sundancer and this is expertly reflected below deck where they get a permanent and sumptuous island double up front, complete with split en suite boasting a king-sized shower stall opposite a separate WC with upmarket Vacuflush head and vanity with sink to port. The interior décor reflects European styling with a combination of cherrywood joinery, quality hardware and fittings, timber blinds, cream carpets (protected with Sunbrella runners) and matching sandstone upholstery. There are light Corian counters in the galley, heads and a soft lighting plan for added evening ambience if that’s your thing. Triple portlights in the saloon, big hatches in the forward cabin and skylights create a sense of connectivity with the outside world. 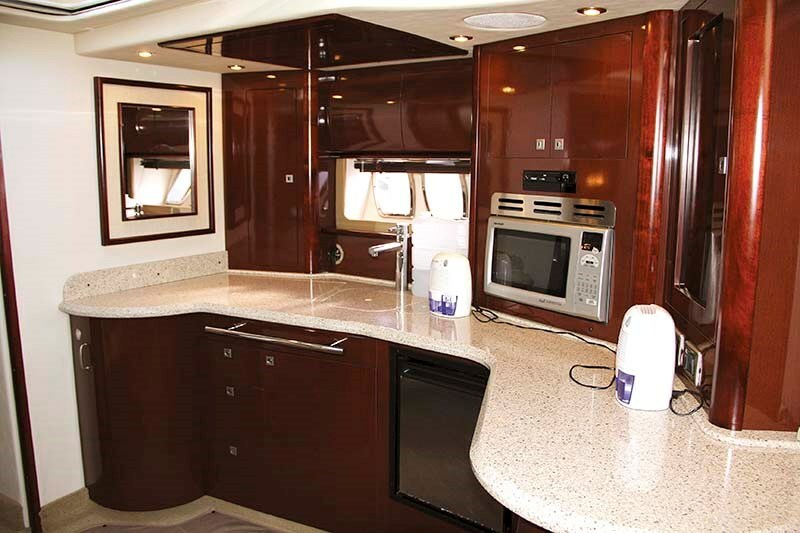 The saloon has a cherrywood dinette opposite a drop-down flatscreen TV in the galley. And with separate 12V fridge and freezer, two-burner electric cooktop, convection oven and generous countertops, cooking is a breeze. There’s even a central vacuum system for easy clean-ups. 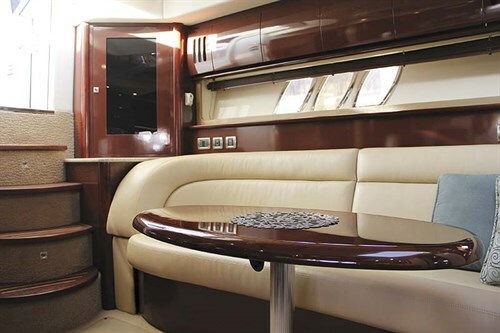 While the interior is open plan, the aft living room can quickly and easily be converted into a mid-cabin where the lounges before the second TV pull out to create a second double berth. There’s even sliding timber doors for privacy. 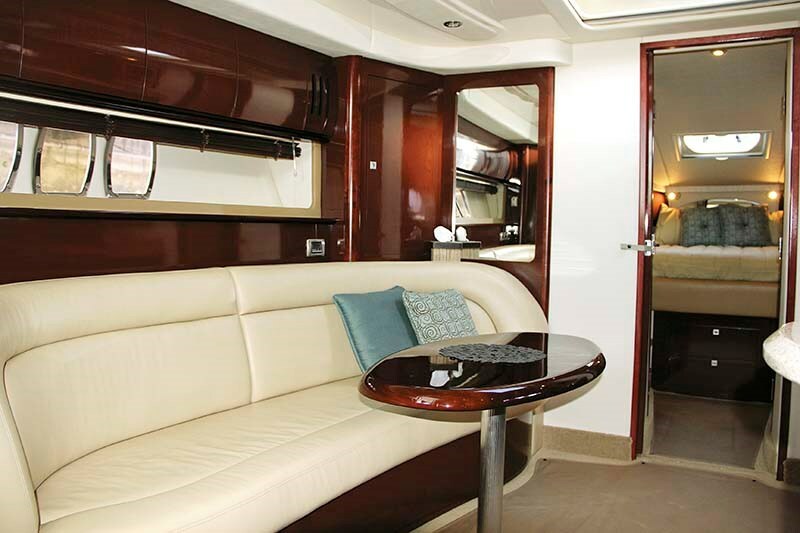 The dinette lounge also converts into an impromptu berth, while the aft dayhead provides all the amenities guests require like a Vacuflush loo and handheld shower. Sea Ray’s ergonomically designed helm works wonderfully well and with some reverse sheer to the decks and a naturally flat running hull, the sight lines are great whether at wide open throttle or manoeuvring in a busy marina. 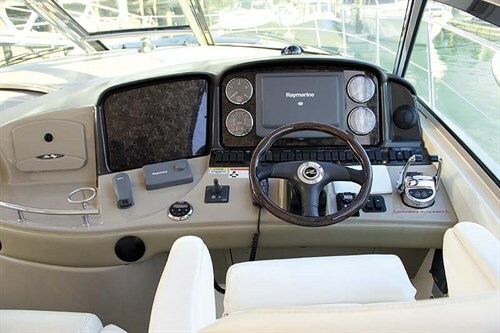 The helm seat has a useful flip-up bolster and the dash is user-friendly and loaded with features including a Raymarine E120 sounder/plotter/radar, analog engine gauges and a big switch panel for everything from pumps and lights to wipers and windscreen vent, plus spotlight remote, sound system and so on. And the AC/DC control panel is operator friendly, featuring water and waste-tank gauges, plus the onboard generator start/stop. Belzara delivers a comfortable 24kt cruise at 2200rpm and a top speed of 28kts at 2600rpm and with her V-shaftdrives you can expect surefooted performance free of driveline vibration. 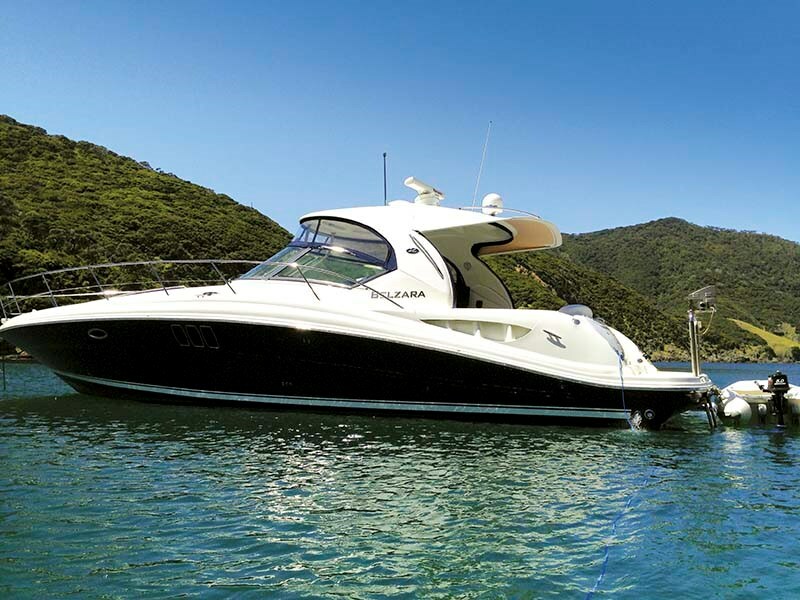 With 400lt of water, 1260lt of fuel, 9kW Onan genset, Cruisair air-con to all areas and more, the Sea Ray 44 Sundancer presents a serious cruising option for those wishing to range far and wide in safety and comfort. Belzara is ready for inspection at Gulf Group Marine Brokers on the water-sales berth at Pier 21 Westhaven.